Students in IC’s Non-Timber Forest Products course will explore more sustainable methods of making maple syrup, thanks to a $30,000 grant from the Dominion Foundation. The course teaches students to create useful products out of the natural landscape, including maple syrup distilled from the sap of sugar maples growing on the Ithaca College Natural Lands. 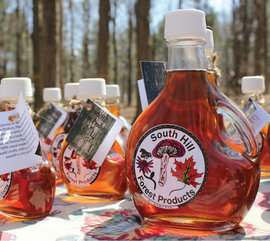 The program taps 100 trees and produces an average of 10–20 gallons of syrup every year, which it sells. With the help of the grant, students will work with faculty members to develop a reverse-osmosis system to reduce the water content of sap, and they’ll also build a solar photovoltaic battery system, among other tasks.